80' on beautiful Bear Lake near the channel with dock & boat lift on private wooded lot. Architect Bob Landman designed cedar home offers clean, minimalist lines, natural materials, neutral palette, skylights and walls of windows. 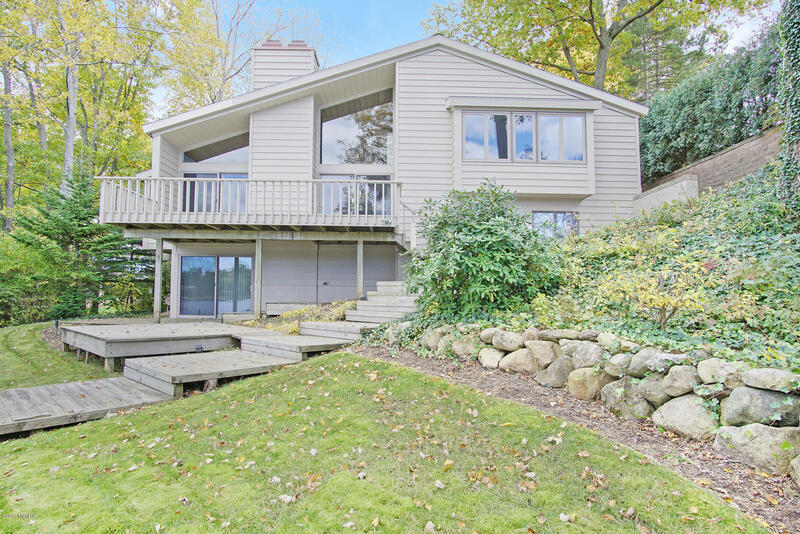 Greatroom w/vaulted cedar ceiling, fireplace & door wall to deck with lake views. Dine among the tree tops in the windowed eating area. Features include open kitchen w/stainless appliances w/Dacor range, a wet bar and a wall of custom built-ins for stylish storage. Master suite w/lake views & large walk in closet, walk out family room opens to covered patio and waterfront.Ttimeless contemporary incorporates natural beauty w/functionality and superior construction for the discerning buyer.Bear Lake channels to Muskegon Lake an Lake MI.North Muskegon boasts top rated schools.Plus proximity to Lake MI beaches, parks, marinas, winter sports complex, golf courses, yacht club and downtown Muskegon's brew pubs, art museum, symphony, festivals, hockey team & more!